The Makena® is a full-featured, full-sized hot tub that’s perfect for daily personal care, family time and entertaining. This Paradise® Series spa features our signature comfort, performance and style amenities including 46 jets, 12 points-of-light, a backlit Acquarella® waterfall, and seating for up to 6 adults. 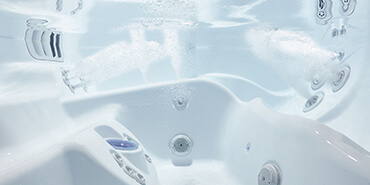 The uniquely contoured seats on every Caldera Spa hot tub let you relax in unmatched comfort. 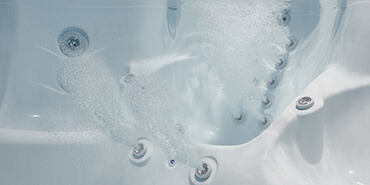 Enjoy the hydrotherapy benefits without struggling to resist the effects of bouyancy. When the powerful jets are off, you’ll simply relax in the spacious interior, designed to cradle you in comfort you can really feel. 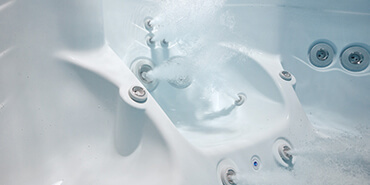 We design our Caldera hot tubs to provide full-body massage where you store tension. Our jets are configured to give you a targeted, soothing massage. As you move from seat to seat in what we call Hot Tub Circuit Therapy, major muscles are massaged. Similar to working out muscle groups on a strength training circuit at the gym, our circuit therapy helps relax and transform those areas most likely to store stress and pain, from the bottoms of your feet to the tightened muscles of your shoulders and neck. Caldera Spas seats are built to maximize comfort by cradling your body in a secure “hug-like” position that allows you to fully experience the warm, massaging waters. Whether you select a Utopia or Paradise Series hot tub, you’ll find every seat is ergonomically sculpted to cradle you body. Stress and tension accumulate in your body and in your mind. Releasing that stress can improve both your physical health and your overall attitude, and affects nearly every part of life, from how well your immune system functions to how well you relate to the people around you. A Caldera Spa can help you release accumulated stress and accelerate recovery of tired muscles. You enter a spa with tension; you emerge changed. You become more relaxed and you are calmed. The warmth of the spa helps increase circulation, so you heal better and faster, you become more flexible and limber and pain is alleviated. It’s the ultimate calming experience. With its exclusive and highly efficient EnergyPro circulation pump, your Caldera spa is always hot and ready to use while meeting the most stringent energy efficiency standards established for portable spas. 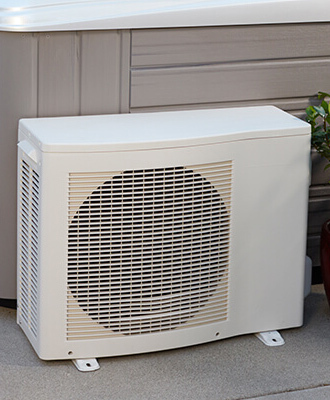 The system operates at very low wattage to filter water and actually reduces heater use since 80% of the energy used to operate it is transferred to the water as heat. Enjoy the comfort of knowing your Caldera EnergyPro heater, a highly efficient system that filters water continuously to keep it clean, is backed by an unconditional limited warranty. A patented system vents the heat produced by the pump motors out of the equipment area to create cooler operating conditions, prolonging the life of your Caldera spa’s components. 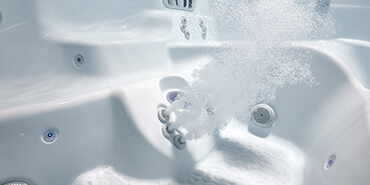 We know you don’t want to handle messy water chemicals so we offer a simple water care system called the FROG® as a standard feature on all Caldera Spas. 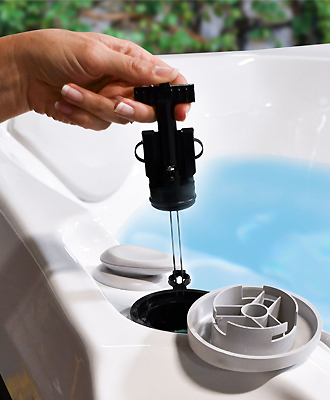 The system makes it easy for you to manage the infrequent replacement of bromine and mineral cartridges so you can enjoy sparkling clear spa water every time you dip into your Caldera hot tub. The Advent control panel gives you command of the spa’s functions at your fingertips. 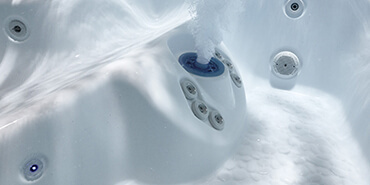 An auxiliary control panel, on Utopia Series spas, lets you operate your spa’s components from a second location within the spa. Along with full-foam insulation, a Caldera cover provides a tight custom seal to reduce energy use. Made of a durable, marine grade-vinyl, it features child-resistant safety locks and conforms to all applicable ASTM safety standards. Given the exposure of the interior spa shell to daily use, a quality construction and composition is critical. Our triple-layer DuraBond reinforcement system strengthens the tough acrylic surface for proven, time-tested performance. A well-designed hot tub has an inviting visual appeal that draws you in and helps you relax. We pay a great deal of attention to the styling of our products for that reason. 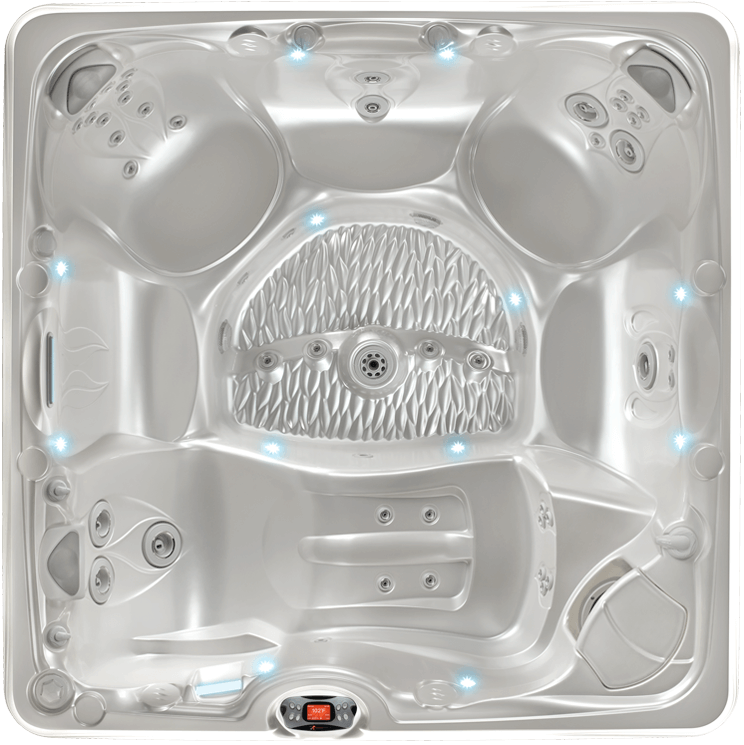 Caldera Spas’ elegant, organic style delights your senses with flowing lines, sculpted jet recesses, ergonomic controls, beautiful lighting and soothing sounds. 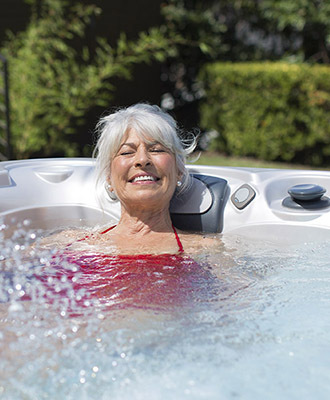 Enjoying a hot tub is a sure way to focus on your personal well-being. We’re sure you’ll experience positive change each time you emerge from the waters. We also know a well-designed hot tub or spa has an inviting visual appeal that draws you in and helps you relax. We pay a great deal of attention to the styling of Caldera hot tubs and options such as lighting and entertainment so that you can create an environment that facilitates personal transformation. Accessorize your Caldera hot tub with a wide range of options that make your spa uniquely yours. Choose from an array of conveniences including steps, cover lifters, hand rails, umbrellas and hydro massage jet kits all designed to help you relax and enjoy your own private retreat. Utopia Series features our exclusive SpaGlo lighting system that illuminates different areas of the spa, including the interior, the Euphoria jet, the Acquarella waterfall, the assist-bar, the diverter, two air controls and three sides of the exterior cabinet. To customize the experience, you’re able to choose from six colors, three levels of brightness and the spa areas you want illuminated. In addition to choosing a hot tub that fits the size, seating configuration and style you prefer, you can also customize your Caldera spa with entertainment options that make it uniquely yours. Listening to music can help you relax and reset your priorities. Choose an integrated MP3 or Wireless multi-source sound system. To really complete your spa entertainment package, add a waterproof Wireless TV. StoneScape exterior is patterned after actual tumbled stones. The cabinet’s natural stone-like beauty and durability comes in a popular gray/earth tone palette that blends with the outdoors. It is an ideal and affordable style complement to a growing hardscape trend. Seat or lounge (varies by model) for neck, shoulder and middle back massage. Multiple jets focus on large muscles in your back. Select models work on wrists and calves. A unique jet configuration relieves tension and pain in your back’s lumbar region. These jets provide a deep, penetrating massage to thighs, knees, calves and feet (Two in most Utopia® models). Jets stimulate and revive the muscles in your feet that bear your full weight all day. VeraSSage® jets allow you to rotate the force of the massage and set a stationary, direct or rotating jet stream. Provides a precise massage to target specific muscles. Makena is a great spa! The frog water system is so easy to maintain and keeps the water crystal clear. I would tell anyone in the market for a spa to definitely consider the Makena.